Each time we take a breath, it's difficult to fully understand the mass of microscopic particles entering our lungs. In our own homes, the places we feel the safest, the pollutant levels on average are two to five times higher than they are outdoors and, when breathed consistently, can cause a variety of health problems. This brings us to VOCs. What is a VOC? 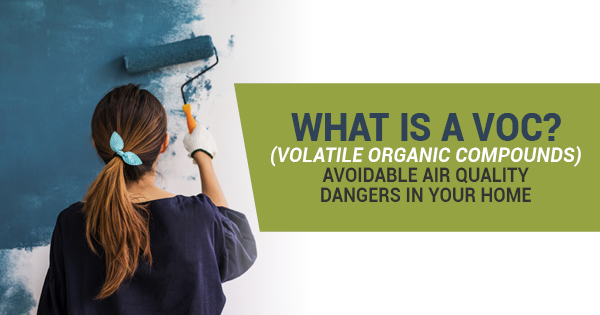 Volatile organic compounds are given off as gases from certain liquid or solid products. For instance, the fumes from painting can contain VOCs. The health effects from VOCs range from nonexistent or unknown to highly toxic, so it's safest to keep your home as low VOC as possible. Let's look at how. When there's a project on the horizon and you have to buy supplies, labels will be your best friend. Few things answer what is a VOC better than labels on household supplies. Read labels thoroughly to know potential risks, proper usages, and appropriate storage/disposal practices. Your first line of defense is simply reading. After getting knowledgeable about what you're bringing into your home and identifying the attached risks, be reasonable about purchasing. Buy what you need for the project at hand. Stockpiling chemicals isn't a great idea, as VOCs leak through sealed containers. Buy for your needs and responsibly dispose of leftovers. Proper ventilation is important for your home regardless of whether or not you're priming walls or painting floors. Fresh air pushes out impurities trapped in your home that you're unaware of. When using products that have odors, it's vital to keep airflow circulating for your safety and the safety of your family. Open windows and doors, run a fan, and you'll make lingering VOCs vanish in no time. VOCs are tough because, as of yet, there aren't any standards that are enforced for private use. This puts the power and responsibility in the hands of the everyday user who, possibly until reading this, hadn't known there was any danger in the products they were using. This awareness is key to keeping your home pollutant free. Carefully read and research to guard what you bring into your home and what should stay out.